If you drink a large glass of tomato juice every day you'll lose a little weight – without changing your diet and without doing more exercise. Researchers at China Medical University in Taiwan stated this after getting a group of healthy women to drink 280 ml tomato juice every day. The researchers got 25 women aged 20-30 to drink 280 ml tomato juice every day for two months. That's a big glass or a small bottle of the stuff daily. At the start and at the end of the two months the researchers measured the women's body composition and analysed blood samples. The researchers did not have a control group that had been given a placebo – subtract a couple of points there. The tomato juice supplementation, as you'd expect, resulted in an increase in the concentration of the carotenoid lycopene in the women's blood. Lycopene is what gives tomatoes their red colour. The body does not absorb lycopene from fresh tomatoes very well, but does do so from tomatoes that have been heated. So tomato juice, puree, ketchup and powder in sauce mixes are all good sources of lycopene. Although the women didn't change their diet or do more exercise, they lost a little weight during the course of the experiment. Their body fat percentage dropped, as did their waist measurement. The effects were small, but they were statistically significant. The supplementation reduced the synthesis of the inflammatory protein MCP-1, but led to an increase in the secretion of the inflammation inhibitor adiponectin. The researchers were able to show that the inhibition of the inflammatory effect of tomato juice supplementation was not due to a decrease in fat mass. The researchers suspect that lycopene or its metabolites activate the enzyme SIRT1 in cells. [J Nutr. 2012 Mar;142(3):405-10.] That enzyme stimulates fat burning. 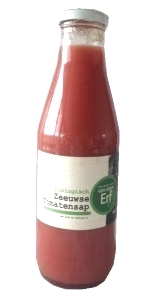 "Daily supplementation for 8 weeks with tomato juice containing 32.5 mg of lycopene in young healthy Taiwanese women has anti-obesity and anti-inflammatory effects", the researchers wrote. "The tomato juice-induced reductions in waist circumference, serum levels of cholesterol and the inflammatory adipokine MCP-1, and increase in serum levels of the anti-inflammatory adipokine adiponectin are unrelated to body fat changes."